A small dig carried out after the scan confirmed the findings. Photo credit: Chichester District Council. 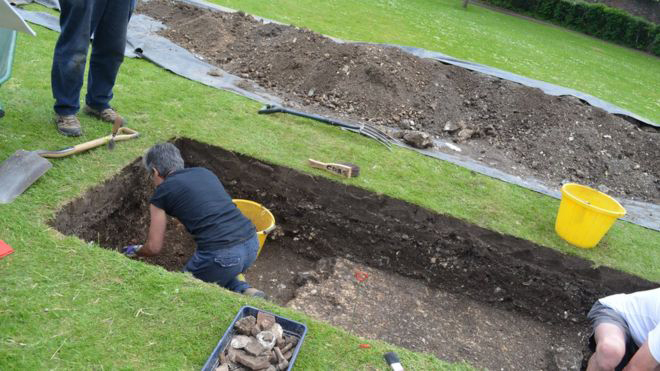 Foundations of complete Roman town houses have been discovered under one of Chichester’s city centre parks and they are expected to be some of the most remarkable Roman finds yet. Archaeologists have been stunned to find three almost complete Roman buildings, footings of which have survived over 1,600 years in the centre of a thriving city. The scans appear to show two large masonry houses, owned by someone of great importance. The third building is of great interest because of its unusual shape. The discovery was made after local geophysics specialist, David Staveley, used ground penetrating radar equipment to scan the parks in Chichester. This was done in agreement with Chichester District Council’s archaeologist, James Kenny, who felt that the parks were the most likely place to discover remains that will have survived. Following the results from the scans, James and the local archaeology society carried out a very small dig in the park which confirmed his thoughts. “What’s remarkable about this discovery is that it has survived over 1,000 years in a currently occupied city. The only reason they have survived is because they are under a park that has never been built on,” says James Kenny, Archaeologist at Chichester District Council. “The location marks what may have been one of the more affluent parts of the Roman Town, with these houses being the equivalent to a property worth millions of pounds in today’s society. The two houses have walls surrounding complete rooms, which are set around a courtyard or atrium. There is also a deep masonry building with a rounded end. We are intrigued to find out what this building is. It could be a cellar, part of a bath house, or something even more exciting. We can’t wait to find out. James believes that the houses were originally located on a street, but that this hasn’t survived because of the World War Two reservoir that was built in the park. The scans reveal that another Roman street ran further east under Priory Park, but this will not be uncovered. Chichester District Council is now in the process of identifying funding opportunities that will allow the council to carry out a more detailed dig. “We want to be certain what the archaeology is and demonstrate its significance. We also want to encourage residents and visitors to come and look at it and find out more about the discoveries that we uncover. We hope to use this evidence to bid for money from the Heritage Lottery Fund to fund a series of excavations over successive years. “As soon as we have more details on this, we will let people know, so that they can come down to watch and find out more. We hope to run site tours and provide information during the dig. This discovery is a unique part of Chichester’s – and this country’s – history, and so it is important that we make this accessible so that people feel involved. “At this stage, we are not thinking of keeping the remains on permanent display – when the work has been completed it is more likely that we will return the ground to its current state. Instead, the likelihood is that we will create 3D imaging and information that will provide people with all of the information that they need in the long term. This might form part of a bid to the Heritage Lottery Fund,” he adds.